A fascinating profile of Brawn GP’s main man from 2001 reveals a ruthless drive for team victory—and a dislike for the kind of public bickering his driver Barrichello has just done. If I get the slightest sniff of the fact that they have favoured Jenson, I will hang up my helmet tomorrow. But I know Ross [Brawn] wouldn’t do that. He asked me to drive for him and he knows I want to race fairly with Jenson. We don't have a one and a two driver. They’re both on equal terms and conditions. Once he [Barrichello] got back and we talked things through he was fine. Rubens is a great team player. Everyone is working so well together and Rubens and Jenson recognise that. The fact we have such a great atmosphere drives us on and we don’t want to lose that. We’ve been completely honest with the drivers. They know the situation and their engineers know that—there’s no favouritism. It’s interesting to put his remarks in context with a profile of Brawn for The Independent in July 2001. Back then, he was technical director of a resurgent Ferrari, celebrating their first driver’s title since Jody Scheckter’s world championship in 1979. 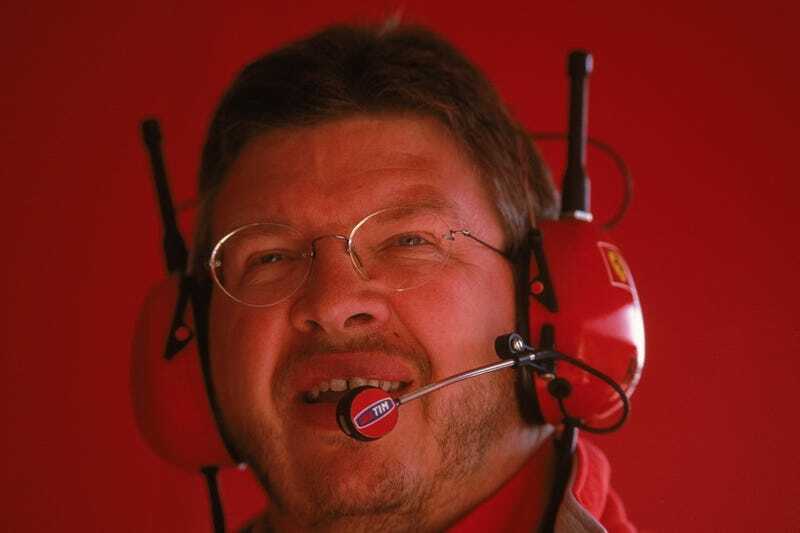 Brawn was a key element of the Ferrari team which included general manager Jean Todt, chassis designer Rory Byrne and drivers Michael Schumacher and Rubens Barrichello—the latter clearly treated as a “two driver”. They would go on to command Formula One for the next four years, with Schumacher taking every world championship between 2000 and 2004. At the time the interview was published, the level of sheer dominance they would demonstrate—where Schumacher would lock up championships in mid-summer—was not yet evindent. Their first balls-out year was 2002. The year when, during the Austrian Grand Prix, Rubens Barrichello would be ordered to slow down in the last lap (see video) to allow Schumacher to take victory—his fifth out of six races in a season where he would win 11 races out of 17 and stand on the podium every single time. “We all kick bums inside the team, Michael included,” Brawn says. “But if he’s unhappy about something he’ll sit down with Jean [Todt, general manager] and me and tell us so. He’s not going to do it in public because he cares about the people here and he’s also intelligent enough to realise he will have more effect working internally than going to the press. Brawn and Todt have had to spell out that message to their other driver, Rubens Barrichello. The Brazilian has complained on a couple of occasions about the “favouritism” shown to Schumacher. The reality, as Barrichello will now appreciate, is that his team-mate is the best in the business and it makes competitive and commercial sense for the team to back him. Formula One is a team sport like no other. Hundred of millions of dollars and the collective effort of hundreds of people focus on two drivers—and only one can become world champion. And while letting teammates compete would perhaps drive both of them to greater performances, look what happened with McLaren in 2007, where Fernando Alonso and Lewis Hamilton were at each other’s throats in dominant cars for the whole season, including the penultimate race in Brazil—allowing Kimi Räikkönen to edge past them both and take Ferrari’s sole post-Schumacher world title. Perhaps Barrichello has just had the incredible bad luck over the years of always getting a superior teammate along with a superior car. And a boss who likes to make the trains run on time.